Renee Gillispie has been named head softball coach at Iowa. Gillispie is the fifth head coach in program history. 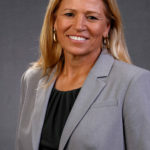 She comes to Iowa after 18 years as head coach at UCF where she compiled a record of 625-403-1 (.608), won five conference championships, and advanced to seven NCAA Regionals, including four straight regional final appearances. Gillispie is a native of Danville, Iowa, and played collegiately at Kirkwood and West Texas A&M University. Gillispie started UCF’s Division I program in 2002, and averaged more than 36 wins per season. She has coached 75 all-conference honorees, 35 all-tournament selections, and 25 NFCA all-region selections. She replaces Marla Looper, who resigned after eight seasons at the helm.